Today, family animation distributor GKIDS announced that they will qualify four animated features for consideration in the Oscars Best Animated Feature Film category. The films are Goro Miyazaki’s From Up On Poppy Hill (Japan), Jean-Francois Laguionie’s Le Tableau (France), Joann Sfar and Antoine Delesvaux’s The Rabbi’s Cat (France), and Rémi Bezançon & Jean-Christophe Lie’s Zarafa (France/Belgium). 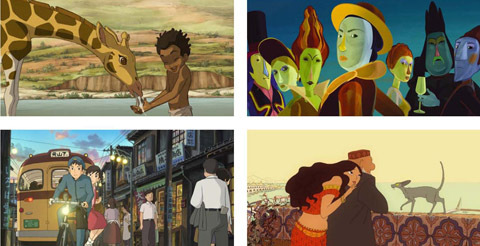 GKIDS has had an outsized influence in the animated feature category over the past three years, earning three Oscar nominations—Secret of Kells in 2010, and A Cat in Paris and Chico & Rita in 2012. Their strategy has been simple and it doesn’t involve producing a single frame of animation; rather they pick up U. S. distribution rights to foreign animated features that otherwise will never appear in America. It’s a win-win for both GKIDS and the filmmakers. Even the major film studios benefit from the situation. That’s because the four films that GKIDS will enter this year push the current number of animated feature contenders to 15. A minimum of 16 features is required to have five nominees in the category, and it is very likely that will happen now. This entry was written by kelvin, posted on August 29, 2012 at 9:17 pm, filed under Animation. Bookmark the permalink. Follow any comments here with the RSS feed for this post. Trackbacks are closed, but you can post a comment.